I am not sure how many people even read Blogger anymore but I will keep posting my latest chart releases here for as long as I can. I miss the good old days when Blogger was so much more active than it is now but I guess Facebook has taken its toll...sigh. Anyway, here is my latest pattern called "Sarah Sykes Sampler". This one is adapted from an antique sampler I have in my personal collection...I really love how the colors are just perfect for spring. I made a few minor changes from the original but just enough to where it needed to be called an adaptation and not a reproduction. The pattern to stitch Sarah's sampler is now available in my Etsy shop...hope you like it! I'm still here, and still enjoying your blog!!! I'm in and out. I'm in at the moment, but who knows when I'll drop out again. For me its all about finding the time to post. I urge you to keep posting! I read the blogs everyday but i don't always comment.Love your sampler. Yeah, I miss the blogs too! Love that you haven't given in to unending ads and pop-ups on your blog. Your patterns are adorable! 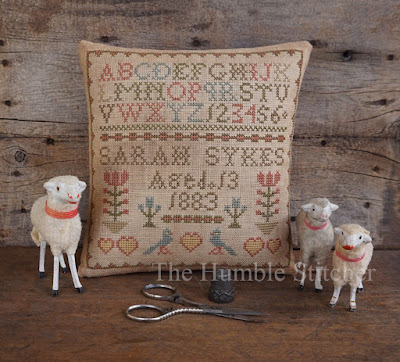 Lovely sampler. There are a few of us still out there who prefer blogging to Facebook. I'm one of them. Blog when you can...life is busy. I’m here. I watch some flosstube but often those are too lengthy and often silly. 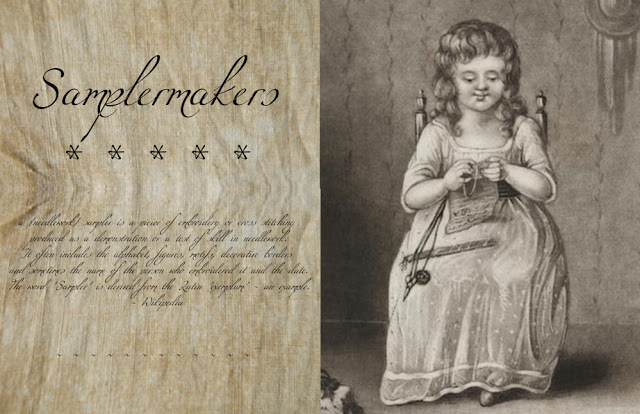 I will continue to blog as The Hoopless Stitcher. Keep posting! Oh Sandy, I love your new sampler. I think you already know how much I love your small in size samplers. I am still here reading blogs and know that some are returning to their blogs which is a good thing. Have a blessed day and a wonderful week!